Originally built in 1716 and added to over the past two centuries, this landmark building has been operating as an inn since 1889. 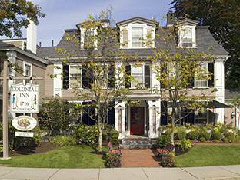 It offers 56 guest rooms in all, and features the Village Forge Tavern which specializes in New England cuisine. Henry David Thoreau lived here for two years between 1835 and 1837, while it was later visited by such figures as Franklin Delano Roosevelt, and J. P. Morgan (and a whole host of celebrities over recent years). It is also worth noting that one of the original structures on the site was used to store arms and provisions prior to the War of Independence – when British troops attempted to seize the supplies stored therein they were met by Militiamen at nearby North Bridge. This event immediately followed the first battle of the American Revolution at Lexington Green. Reviews and Booking. Please note that nightsinthepast.com plays no part in the actual review, booking or reservation process for this or any other accommodation. Costs for maintaining and developing Nights in the Past are met solely by it being the last referring site to our partners which results in a completed reservation. Privacy and Cookies: Like most websites, we use some cookies for the purposes of gathering statistics so we can continually improve for future visitors. By continuing to use Nights in the Past we assume you are happy with this. See our Privacy page for further information if required. We do not solicit or gather personal information, and any individual correspondence entered into will be treated with the utmost respect for privacy. Please notify us immediately if you believe this site has been compromised by a third party.